Frank P. Petrash, 91, of East High Street, Coaldale, died peacefully on Monday, April 6, in the Phoebe Home, Allentown, following a recent illness. He was the husband of Martha (Chuckran) Petrash. They had been married for 62 years. 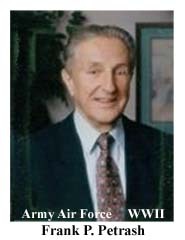 Prior to retiring, he was a medical technologist for the Margaret Petrash Laboratory and the Anthracite Medical Lab for 45 years.Born in Coaldale, he was a son of the late Frank J. and Susan (Petko) Petrash.A veteran of World War II, he served with the 15th U.S. Army Air Force, 449th Bombardment Group, 718th Bombardment Squadron, from February 1943 through May 1945. During his service in North Africa and Italy, he was awarded a Good Conduct Medal, Distinguished Unit Badge, the Oak Leaf Cluster and 11 Bronze Stars.Petrash was a lifelong member of SS. Cyril and Methodius Catholic Church, Coaldale.A 1935 graduate of the former Coaldale High School, he was also a member of the American Legion and Veterans of Foreign Wars posts, both of Coaldale; and the AMVETS Post, Lansford.He was a life member, esquire and past exalted ruler of Lansford B.P.O. Elks Lodge 1337, and a member of the Tamaqua Elks Lodge 592. He was named Elk of the Year in 1975.Petrash served on the Carbon-Schuylkill Industrial Development Corporation from 1969 to 2005, and was a past president of its board of directors.He was a member and past chairman of the Schuylkill County Housing Authority, having served from 1970-2000; and was a Coaldale Borough Councilman from 1966-83, serving as president for 10 years.He was an inductee in the Pennsylvania Voter Hall of Fame, having 60 consecutive years of voting.Surviving in addition to his widow are three sons, Frank, and his wife, Patricia, of Hatboro, Michael, and his wife, Evelyn, of Center Valley, and Gary, and his wife, Cindy, of Pottsville; a daughter, Marian Petrash, wife of Tyler Wood of Eugene, Ore.; a brother Thomas, and his wife, Marge, of Bloomsburg; and five grandchildren, Jessica, Frankie and Noreen Petrash and Liam and Alex Wood.He was also preceded in death by three brothers, Paul, Rudolph and Joseph; and a sister, Margaret Valentine. Service: Mass of Christian Burial 10 a.m. Monday, April 13, St. Katherine Drexel Catholic Church, Lansford, with the Rev. Thomas Derzak officiating. Interment, SS. Cyril and Methodius Cemetery, Nesquehoning. Call 7-9 p.m. Sunday and 8:30-9:30 a.m. Monday, August M. Gulla Funeral Home, 130 E. Ridge St., Coaldale. Memorial contributions - thank a veteran on Frank's behalf. Online registry at zrgfuneralhomes.com.